Hawaii is a perfect place to vacation with long sandy beaches, clear waters, and the laid-back lifestyle on the island. Most tourists visit Oahu, the most populous of the Hawaiian Islands and home to the capital city Honolulu. You can find lots of hotels and resorts with amazing views or even get your own Oahu beachfront rental that overlooks the beach. The most popular place to visit is Waikiki. This article covers the essentials and offers travel tips for people who are planning to take a vacation to this beautiful Hawaiian destination. Waikiki is the tourist hotspot on Oahu Island that’s a few kilometers to the south of Honolulu. An interesting fact is that the name translates to ‘spouting water’ in Hawaiian. This area is a beach lover’s paradise with a long beach that stretches the length of the town. The coast is lined with high-end hotels, boutiques, and malls making it very convenient for tourists. If you’re spending a few days here, the best way to get around is by walking. The town is only around 3 kilometers and walking from one place to the other is probably the fastest and easiest way to go sightseeing. If you do have your own transport, be aware that parking is limited in Waikiki. There are lots of different types of local and international cuisine available in Oahu too. Visit some of the food trucks or sample the local dishes such as Poke and Shave Ice. Poke is like sushi served with rice and salad whereas shave ice is a flavored ice dessert. You can also find a number of Japanese restaurants to cater for the huge number of Japanese tourists. What are the Must-See Sights in Waikiki? The most popular activities in Waikiki are related to the beach and surf. Expect sandy beaches and clear blue water, which makes it perfect for swimming in the warm Pacific Ocean. This region also has the reputation for being one of the best beginner surfer spots in Hawaii. Tourists regularly come here to attend surf school before tackling the larger waves on the other parts of the island. Advanced surfers looking for a challenge should head to the northern coast of the Oahu. Apart from visiting the beaches, another must-do activity in Waikiki is to climb up Diamond Head Crater. This is a huge 300,000-year-old crater that hugs the coast near the beach. The hike to the top typically takes between one to two hours depending on your level of fitness. And the walk is easy if you take it slow and steadily. You’ll be rewarded with the views from the top of Waikiki and the Pacific Ocean below. Admission is $1 for pedestrians or $5 if you have a car. Take note that you can’t enter after 4.30 pm and the gates close at 6 pm. The Waikiki Aquarium and Honolulu Zoo are two other amazing places to visit in Oahu. The first holds hundreds of different species of marine life including an array of tropical fish, sharks, and jellyfish. Honolulu Zoo has rhinos, lions, and giraffes and a number of other exotic animals. Both make for a great trip, especially if you’re travelling with a young family. We can’t have a mini-guide on Waikiki without mentioning the opportunities to snorkel and dive. There are lots of spots around the island and you can easily find rental equipment at an affordable price. Some boats take you out to well-known dive spots a few kilometers out and you’re certain to be in for a treat. Different tours offer different packages and it’s worth doing your research before you arrive. And the final thing that you have to do is sit on Waikiki Beach and watch the sunset over the Pacific Ocean. This is popular with locals and gives you time to reflect on what an amazing trip you’re having in Hawaii. There are three important tips that all tourists should know before they take a vacation to Waikiki. The first is to check out the ABC chain of stores that are dotted along the streets. You can find pretty much everything you need here as a tourist from breakfast to sun cream and shorts. This is a popular stop for visitors to stock up on their essentials in one convenient location. The next tip is that you can find a lot of free entertainment in Waikiki. This includes live music in most bars and restaurants. You can also attend free lei making lessons or take a hula class at the Royal Hawaiian Shopping Center. When you arrive, check online or ask your hotel for information on these events. Some are certain to give you a cultural insight into the local Hawaiian culture. 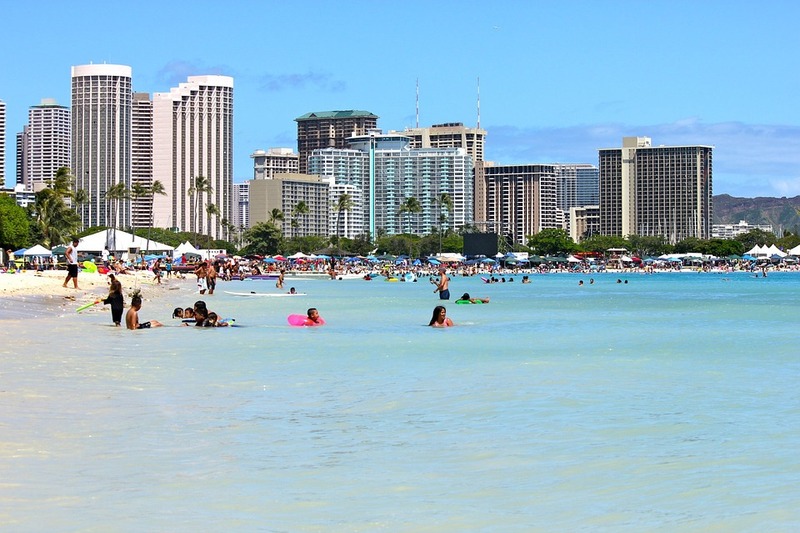 Waikiki Beach is the most famous and therefore is always crowded. When you get into the water, hundreds of people are surfing or learning to surf. But, you should be aware that there are lots of other beaches in and around this region too. With a little planning, it’s possible to find somewhere that’s relatively secluded. Waikiki is an amazing place to visit for the laid-back lifestyle and to catch a few sun rays and waves in Hawaii. There are lots of activities and cultural things to do apart from just sitting on the beach all day. Get out and make the most of your time in this beautiful destination in Hawaii.